I started working for Médecins Sans Frontières/Doctors Without Borders (MSF) because I wanted to do something different. Back in London, I was working for very wealthy people building houses. Quite frankly, I couldn’t bring myself to discuss any more light fittings, and thought: “There’s got to something else out there that’s more worthwhile. And, lo and behold, I started working for MSF and was sent straight out on my first assignment to South Sudan, as a logistician. I got chucked in at the deep end and that was quite a shock. Now, I'm on my second assingment on board the MV Aquarius, a search and rescue vessel on the Mediterranean Sea run by SOS Mediteranee in partnership with MSF. This is my fourth assignment in total, and my first working as project coordinator. I've now seen about 36 rescue operations; some really difficult, some pretty easy. As a logisitician, my main responsibilities are food, shelter, water and sanitation, and implementing security. This involves a lot of blankets, a lot of food, and a lot of toilet bombs (my nickname for tablets you put into portable loos). When you're in charge of provisions, you have to make sure there's enough supplies - otherwise the operation is pointless. It's about always being preapred for any eventuality. But the truth is, you can't really be - we once had seven consecutive rescue operations in 48 hours - so you just have to deal with what you've got. Yet while I have my main duties, and the medics do their thing, on the boat everyone’s a kind of all-round “get stuck in” person. I always say to anyone on board that no one is bigger than cleaning the toilets, because you all need to. So the project coordinators, search and rescue coordinators, doctors, nurses, and comms people, are all in there, doing their part. 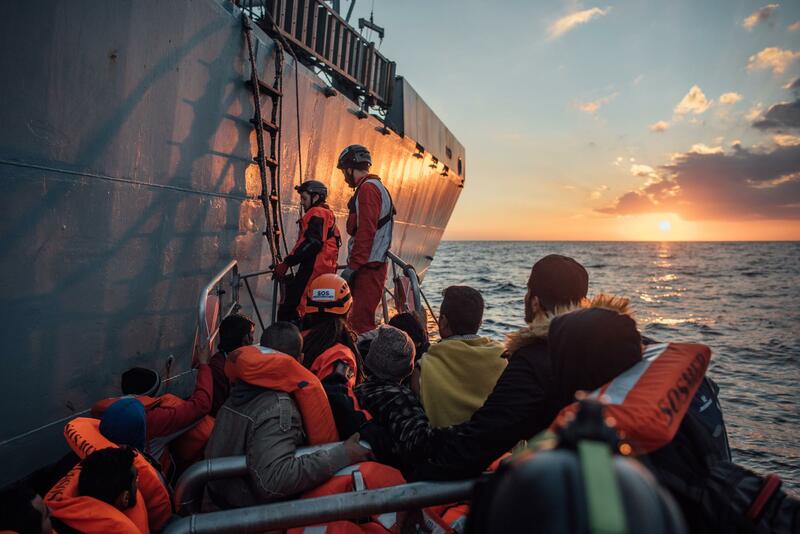 The first thing rescued people do when they're on board is sleep, because they're knackered. The next day it's a bit more euphoric and they're mucking about on the boat, socialising, because they know they're safe and we're looking after them - sometimes a bit of dancing happens! Then the mood suddenly drops. You can feel it, because they're all terrified and nervous again. They don't really know what to expect or what the next phase of the journey is. Ultimately, all Aquarius is is one leg of their long, multi-faceted journey - it's not like they get rescued out of the sea and that's it. They've crossed the desert, been subjugated, extorted in Libya, survived being shipwrecked, and now they've got to go and be 'welcomed' into Europe and don't really have a clue what's next. It's a constant facing of the unknowns: you definitely feel the tension, nervousness and anxiety. There was one rescue I'll never forget. We had a man on board who we had rescued earlier in the day. Just as we were about to take a transfer from another boat, he started jumping up and down really excitedly. He was on the top deck and pointing to the other boat, and I remember wondering what on earth he was doing. So I went over to talk to him - turns out he'd just spotted his wife and children being transferred to the Aquarius. He told me that the night before they'd come under gunfire on the beaches. He put his family into the first rubber dinghy he could find - it was pushed out to sea before he could get on, and he was left standing on shore with no idea where they were headed. He never believed he would find them again - I mean, how would you? When they reunited it was beautiful. The magic of being able to bring people together on our boat is quite amazing. The most rewarding part of this experience is getting people out of the sea, onto the boat and looking after them.